It was a Saturday. Raksha, Nilanjan and I were savouring a cold, windy evening at Shimla’s Mall Road. The main square was beginning to look deserted as tourists rushed to restaurants for a meal or hotels to retire for the day. The weather was turning out to be rather intolerable for dwellers from the plains. The valley, a sight of relentless urbanisation during broad daylight, transformed itself into a sea of glittering lights in an omnipresent black. ‘Kuch dil ne kaha’, composed by Hemant Kumar, is a woman’s moment of self-contemplation; a peep into her desires, inhibitions and fears – masterfully expressed by lyricist Kaifi Azmi. Walking by herself in the mountains, a plain and yet so-stunning Sharmila Tagore gives a face to Lata Mangeshkar’s voice. But listening to Gupta’s incredibly confident and melodious tone, I found the Azmi song effortlessly dissolving into a man’s expression instead. The play on ‘Kuch dil ne kaha, kuch bhi nahin’ – also heard in the original – was his tour de force, later outsmarted by the poignancy of ‘leta hai dil angdayiyan, is dil ko samjhaye koi‘. In no time – but what also felt like a long session – he wrapped up the song beautifully, without letting a single note slip, as if he were carefully tucking a baby to sleep. It won’t be an exaggeration to say that Gupta’s rendition is a perfect foil to the original song, composed almost fifty years ago. I can also imagine Roop Kumar Rathod doing full justice to it. The Tagore-starrer song appears to be an extension of ‘Dheere dheere machal’, which features her on-screen mother singing by herself as she plays the piano. You can draw further parallels as you notice Tarun Bose, who plays the role of Tagore’s father, listening to his wife behind her. And in ‘Kuch dil ne kaha’, an unobtrusive, curious Dharmendra is Tagore’s sole listener, who catches her off guard in the end. Both the songs discuss matters of the heart; the women – related to reach other – are demure and subservient, the men spectators and cause some interruption on being sighted. What if Asha Bhonsle, arguably a far more versatile singer than her sister-rival Mangeshkar, had been chosen as the playback singer for these songs? Perhaps it is this versatility that made her sing for Shashikala, who plays a modern, carefree and independent-thinking woman in the film. It’s hard to imagine Mangeshkar delivering the required pep element in ‘Kyun mujhe itni kushi’, a party song that features Shashikala and Deven Verma. But you can imagine Bhonsle sing ‘Kuch dil ne kaha’ or ‘Dheere dheere machal’, and giving a refreshingly different take, perhaps. In ‘Bheegi bheegi faza’, Shashikala lets her hair down during a picnic sequence. And you know it is – Asha. But Azmi sahab emerges in his full element in ‘Ya dil ki suno duniya walon’, sung by the multi-talented and legendary Hemant Kumar. The song opens with Dharmendra, who plays the role of a writer and teacher in the film, standing in the centre of a social gathering of rich people. The contrast is stark – the man is wearing a crumpled kurta pyjama and kolarpuris; and his visibly moved listeners are dressed in dinner jackets. For a moment, it seems one man is pitted against a powerful social order, the essence of Azmi’s politics. The words speak of grief, depravity and hopelessness. Kumar’s forlorn notes give voice to the Azamgarh-born poet’s anguish, who also known as the writer of resistance. Azmi, who died in 2002, was first influenced by the Quit India movement of the 1940s, that would eventually lead him toward the Communist Party of India. As a member the left-leaning and anti-colonialism Progressive Writers’ Association, Azmi supplemented his street social activism with literary work, which was a breakaway from traditional Urdu writing. 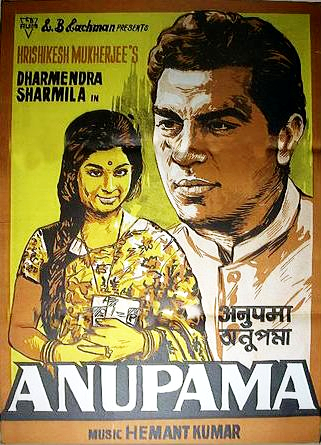 With a pervasive shot of Dharmendra’s looming shadow, the sequence of ‘Ya dil ki suno’ seeks to magnify the socialist side of Kaifi Azmi, who was hitherto speaking about love and romance in the film. The listeners, probably more well-to-do, appear sidelined in the discourse. The film received Filmfare Award for Best Cinematography, Black & White.